Taryn Simon, An Occupation of Loss, 2018. A commission by Artangel and Park Avenue Armory. From films to installations and performances, Artangel enables works with a sense of magic and otherworldliness about them, in unexpected places. Indeed it has helped a roll-call of celebrated artists realise more than 125 exceptional projects since 1991. Rachel Whiteread, House, 1993. An Artangel commission. Photograph by Edward Woodman. Co-directed by James Lingwood and Michael Morris, Artangel exists to commission and produce ambitious ideas in surprising situ. Rachel Whiteread’s Turner Prize winning House (1993–4), Break Down by Michael Landy (2001) and Roger Hiorns’ Seizure (2008) have all been made possible through the organisation – the latter using 90,000 litres of copper sulphate liquid to crystallise a south London council flat. 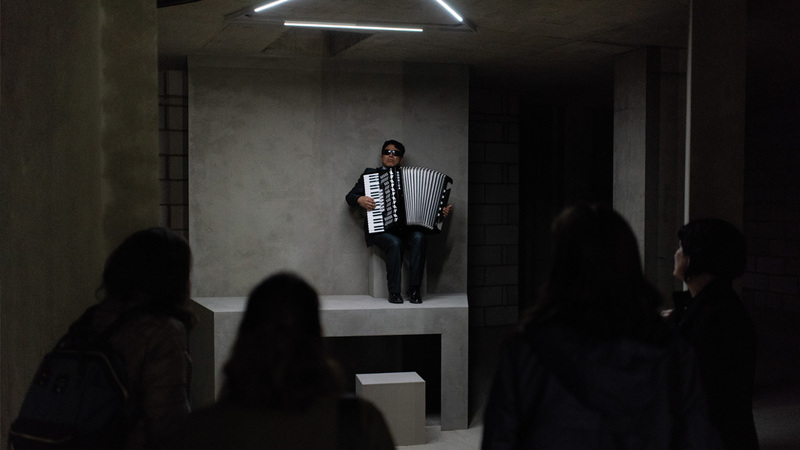 Its most recent project, Taryn Simon’s An Occupation of Loss, her first major performance in London, was presented in a cavernous, undiscovered space beneath Islington Green during April. Previously the ICA’s Director of Performing Arts in the 1980s, aside from Artangel, Morris is an Artistic Adviser to Manchester International Festival, 14–18 NOW, the Roundhouse, the Wexner Center in Ohio and Robert Wilson’s Watermill Center in Long Island. Whilst Lingwood is a Trustee of The Art Fund, The Paul Hamlyn Foundation and adviser to the London Design Festival and Como’s Fondazione Ratti. This June, Artangel takes residency in Cork Street, staging an exhibition fundraising initiative to keep enabling bold works that don’t exist yet. Expect art by its collaborators, from Stephan Balkenhol to Matthew Barney, Nan Goldin to Wolfgang Tillmans. But this time everything’s for sale. With Seizure being one of Artangel’s most talked-about projects, who better to find out more than Roger Hiorns? 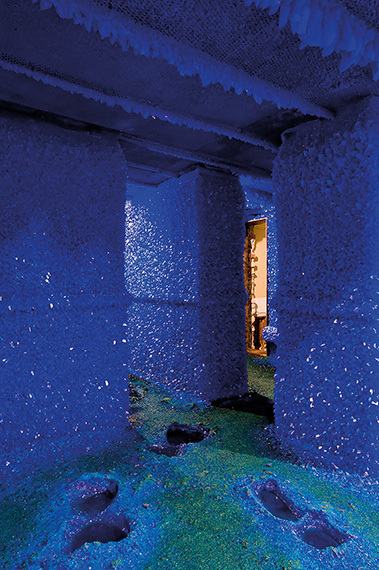 Roger Hiorns, Seizure, 2008. An Artangel commission. Photograph by Marcus J Leith. Roger Hiorns: Cork Street isn’t really where you’d expect to find something presented by Artangel. Can you tell me what the plan is? James Lingwood: It’s true, it isn’t our natural habitat. But there’s a very good reason for us being here this June. Artists for Artangel is an exhibition, at the heart of a new fundraising initiative, of works by 35 or so artists who have made new projects with Artangel. So it will be, exceptionally for us, an exhibition of works which people can buy. Being in the street which has been an important place for galleries and a destination for collectors since the 1960s feels right for this venture. RH: Tell me about some of the work in the exhibition. JL: We’ve reached out to artists from the 25 years that Michael Morris and I have worked together at Artangel. So the exhibition starts out with sculptures from artists we worked with in the early 1990s – first Stephan Balkenhol and Juan Muñoz, then Rachel Whiteread and Matthew Barney, and it continues through to artists with whom we’ve worked much more recently, notably in the Reading Prison project, like Nan Goldin, Rita Donagh, Robert Gober, Steve McQueen, Wolfgang Tillmans. There will be some sculptures based on a collection of stolen birds’ eggs by Andy Holden from the Natural Selection exhibition he made with his father Peter last autumn, and Taryn Simon this spring. RH: How much do you think the show will reflect the historical relationships? JL: Jeremy Deller is working with us on the exhibition and he’s interested in the history. We’ll see how it will play out. A few of the works that artists are giving relate specifically to the project they made for Artangel: Ilya and Emilia Kabakov have given a sculpture with angel’s wings which come from their great Palace of Projects installation. 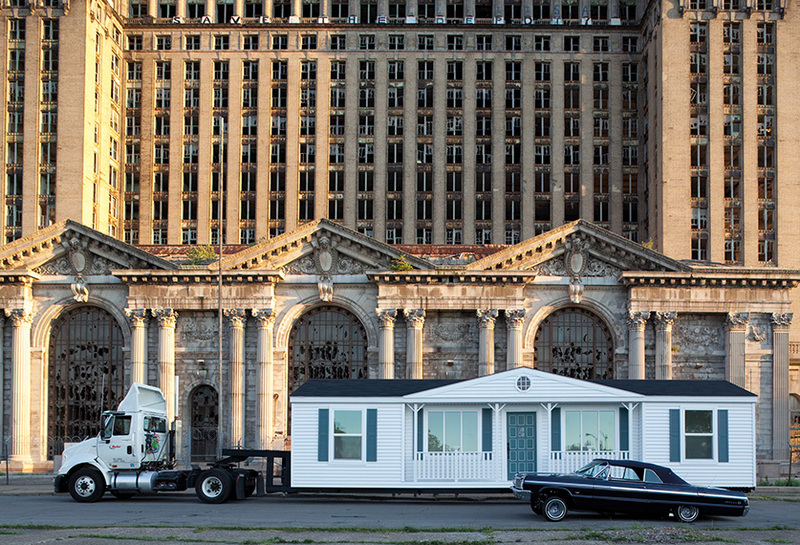 There’s an extraordinary work based on Mike Kelley’s Mobile Homestead in Detroit; a metal mobile, an architectural model which doubles as a lamp, hangs above a sealed ‘basement box’ holding a treasure trove of works by some of Mike’s friends – Jim Shaw, Paul McCarthy, Tony Oursler, Cameron Jamie and Laurie Anderson amongst others. The relation of other works to the history will be tangential, but still there. 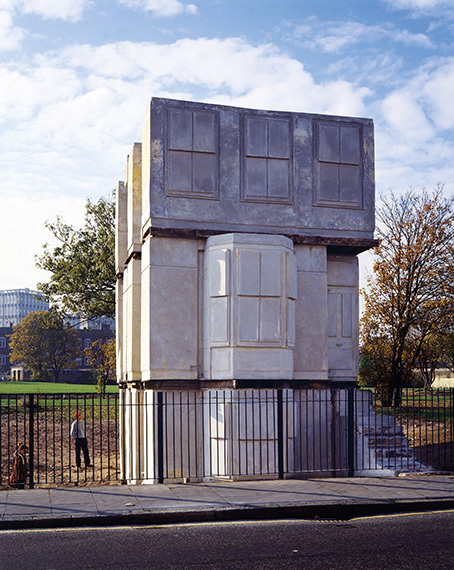 Rachel Whiteread is making a new sculpture based on a window of a house, for example. The exhibition will definitely reflect how important London has been to Artangel, it’s where over half the projects we’ve realised have been made. Susan Hiller’s making a new sculpture with a classic jukebox with 70 songs about London that will provide one focal point. Richard Wentworth is working on an album of sorts involving maps and photographs of London. 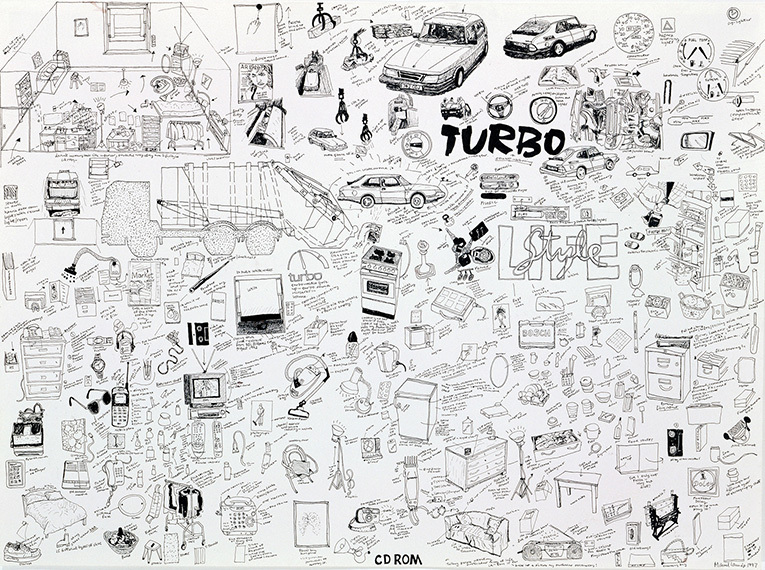 Michael Landy is remembering his installation Breakdown in a new drawing. RH: What are your raising money for? What are the plans for the future? JL: As you know as well as anyone, the process of commissioning and producing new projects can be very volatile. We embrace this unpredictability, it’s a condition of working without your own space, but at the same time we need to create the best possible situation for Artangel and the artists we work with, to get behind exceptional projects in a really decisive way. So Artists for Artangel is about building a new commissioning fund for the future. RH: How far ahead are you looking? JL: Given that we don’t have a presumption of permanence, 5 to 7 years is probably far enough. That’s a good time frame for us to work with. From 2019 onwards, we’re imagining some projects of very significant scale with individual artists. Perhaps there will also be the occasional project involving a range of different artists like the project inside Reading Prison in 2016, with artists such as Vija Celmins, Marlene Dumas, Robert Gober, Nan Goldin, Wolfgang Tillmans etc, writers including Anne Carson, Deborah Levy, Gillian Slovo and Colm Tóibín and performers from Ragnar Kjartannson and Patti Smith to Lemn Sissay and Ben Whishaw. It’s too early to mention individual names, but these will be expansive projects. Artangel’s future fund will ensure we have significant resources in place to get behind some really exceptional ideas in a major way. RH: Have you needed to raise funds like this in the past? JL: About 15 years ago, we decided Artangel would spread its wings to produce one-off projects outside of the UK in places of particular significance to individual artists. To kick-start this, we raised money for a new International Commissioning Fund. We raised about £750,000 from a silent auction and a related campaign. That was in essence a start-up fund, giving us the wherewithal to commit to projects and create the right kind of momentum. This time we’re aiming to build a new fund of at least £2.5m. RH: What did the International Fund make possible? JL: Roni Horn’s Library of Water in Iceland, Mike Kelley’s Mobile Homestead in Detroit and Cristina Iglesias’s Tres Aguas in Toledo in Spain. These are all long-term, ongoing projects, we celebrated the 10th anniversary of the Library of Water last summer. Being able to work with different time frames, with duration, with ideas and forms which are evolving rather than fixed, is something we’re very interested in exploring. RH: Have you found recently that there are projects that you would have liked to take further but there has been a glass ceiling? 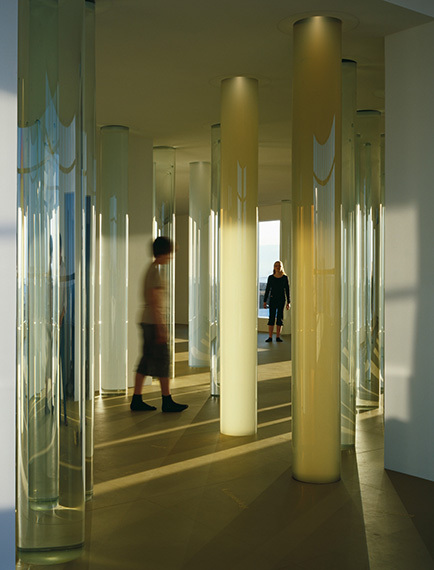 Roni Horn, Vatnasafn / Library of Water, 2007. An Artangel commission. Photograph by Stefan Altenberger. JL: The life cycle of a project is always an intriguing question. How long should something last? How long can we afford for a project to last? Sometimes the exhibition period time frame is pragmatically what’s possible in relation to a borrowed site or where there are live elements – performers and musicians. It would have been great to have run the project in Reading Prison for much longer, though I’m doubtful we could ever have persuaded the Ministry of Justice, who own the prison, to agree to that. It’s certainly helpful to have the capacity to extend the lives of certain projects, to respond positively to the momentum they build. Giving projects the greatest possible duration without compromising their integrity is important. It’s not always predictable – as we found out with Seizure. (note – Hiorns’ site-specific work Seizure, commissioned by Artangel and realised in 2008 involved the crystallisation of the inside of a small flat in south London). RH: There was always something within the DNA of an Artangel project, to do with its temporary nature… I think with Seizure I was always going to work against that a little bit. I was always interested in seeing if there was a possibility of giving it a longer life. The way we made the piece, with the engineer making such a strong steel casing for the copper sulphate solution, gave it an accidental longevity, so when we were told the site where Seizure was made was going to be redeveloped, I was able to come up with a plan to move the sculpture elsewhere. It found a home in a new architectural housing at the Yorkshire Sculpture Park. When the time came to dismantle Seizure, I remember I was haunted by a piece of writing by Wallace Shawn, a piece called Designated Mourner and there’s a really great monologue about whether you’re going to be the last person that exists on the planet who will appreciate and understand a type of mythology that a certain group of people used to enjoy, in this case it was a liberal intelligentsia being pushed to extinction by a fascist junta. That haunted me during the period of talking about Seizure’s dismantling. It was at the time of a first wave of reaction against the immaterial of the internet and I was really fascinated about the idea that things had to be physical in order to be assessed and remembered, because in a way there was so much emphasis on the immaterial. JL: How do you think about that 10 years on? RH: It’s tricky but I think there is a reinforcement now of things existing in reality, even though unreality is becoming slightly more effective in its unreality… you’re also offering the possibility of some new commissions as part of Artists for Artangel? JL: Yes, as this is about creating a future commissioning fund, it feels right. There are a handful of artists who are offering new commissions which will benefit the fund, for example, a new site-specific sound work by Susan Philipsz, a new installation by Cristina Iglesias combining a found environment with sculpture and water. A pair of portraits by Michael Landy. And then there’s an offer for a major new work by yourself. Could you briefly describe the idea? RH: It’s another large-scale crystallisation but this time around it’s more hermetic to some degree. It’s a new piece of architecture, a sculptural concrete structure that exists in the landscape. Crystallisation is a process that can be scaled up, it’s essentially about pouring liquids into a container. I think there is something interesting about taking the idea further in the context of a new building. JL: What kind of building? RH: Certainly a space for a kind of contemplation, perhaps a personal access to spirituality to some degree. A chapel in a meadow is something I’ve thought about, where there is an ideal but also the corruption of an ideal. JL: Who would design this new concrete housing? RH: I would work with an architect, for sure. The ongoing conversations I have with architects are very important to me, with Adam Khan, Stephen Witherford from Witherford Watson Mann, Foster & Partners or 6A for example. Mike Kelley, Mobile Homestead, 2010. An Artangel commission. Photograph by Corinne Vermeulen. JL: The main thing is that we need to find someone who really wants to make this happen, and can suggest an interesting situation. RH: Is this exhibition in Cork Street something which will interest you in the future? JL: Hopefully once will be enough. We have an ambitious goal and we’re drawing on a great deal of goodwill to help us get there – from artists, from their galleries, from patrons and collectors and so on. Then hopefully we can concentrate our energies on making a new generation of great projects happen.